I admit I like the Ruger SR9 9mm pistol. While the tests in different magazines were mostly positive, word that spread across the Internet was that the gun was not what it could have been. I did not find this to be the case. Most criticisms of the SR9 centered on the trigger, and I admit I was not fond of it. I felt that the striker release was severe and offered a glitch in the action that was hard to ignore, and there was a lot of overtravel. I shared my concerns with several Ruger executives, and they said they would look into it. In the end, they addressed them sooner than I anticipated. As everyone reading this knows, Ruger has recalled the SR9 due to a potential problem with the trigger system. If the gun is dropped on the rear of the slide, the gun can fire. Ruger deserves credit for what it did next. The company issued a complete recall--and paid shipping--for all of the guns affected, and replaced the trigger system on each gun. 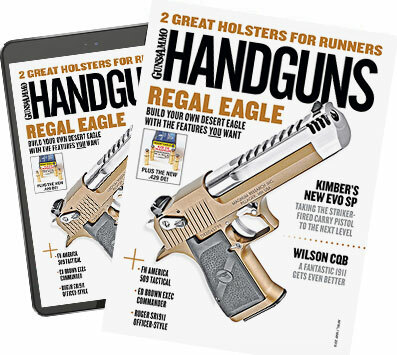 In addition, each customer received a free high-capacity magazine for the inconvenience. A number of parts in the trigger assembly are replaced, the trigger itself being most notable among them. The original design was a two-piece trigger comprised of an inner and outer "shoe" with the inside one hidden. The updated design utilizes a visible inner trigger, which retards rearward travel unless it is depressed. This design is similar to Glock's. The redesigned trigger reduces overtravel and increases trigger control, making quick follow-up shots easier. Also upgraded is the magazine release button. The first production buttons were quite stiff, requiring direct inward pressure by the thumb to release. Retrofitted pistols receive a new version, which is easier to depress and works well. The magazine disconnect and disconnect spring have also been updated, as have the striker blocker and striker blocker spring. All of the upgrades are internal, so the gun looks the same on the outside. The SR-9 is the thinnest high-capacity 9mm pistol available, which not only makes it easy to carry and conceal, it's easier for those with small hands to shoot. A reversible rubber backstrap offers a nicely contoured arch for those with large hands. Equate the grip to a 1911 with either a straight or arched mainspring housing. The grip has nice checkering all around that offers a positive grip surface in all kinds of weather, yet isn't too sharp. Ambi safety levers are placed at the rear of the frame. Since all of the modifications are internal, the only way to find out if they are indeed improvements was to shoot it. The 9mm is one of the few calibers that is still reasonably priced, so I intended to shoot as much ammo as I could. To test the updated gun's accuracy I shot five-round groups, resting my wrists over my range bag, at six-inch Birchwood Casey Dirty Bird targets 25 yards downrange. Results are shown in the accompanying chart. In the end, I was quite happy with the updated SR9. It shot where I pointed it every time, and in an armed confrontation that is the single most important feature a combat pistol can possess. I fired in excess of 1,000 rounds of various hollowpoint and FMJ styles through the SR9 without a single failure, which was not really that surprising. Ruger builds all of its products to both work and last. I really liked the fact that most of the trigger overtravel is gone. When the striker is released, the trigger stops, and that is how it should be. I will say that the trigger still had a bit of a glitch when I first started shooting it, but after 200 or so rounds, it smoothed out and ended up being quite manageable, especially for combat applications.